Regionalisation has in recent years been intensely discussed as a possible path for the future Common Fisheries Policy of the European Union. However, the motivations for moving in this direction are as varied as the perceptions of what regionalisation as a mode governance would entail in practice. To draw implications for policy, we explore these perceptions and seek, by means of interviews and a survey of participants in the Regional Advisory Councils with hands-on experience in regional cooperation in European fisheries management, to flesh out the question whether regionalisation is seen a good idea, why or why not, and how people perceive different models of regionalisation. The article documents and substantiates the widespread interest in regionalisation, but it also highlights the need to develop common understandings of which options of regionalisation are available and what they offer in terms of future benefits and challenges. The release of the Commission of the European Communities’ (Commission) Green Paper in April 2009 (Commission 2009) placed regionalisation firmly on the agenda for the coming reform of the European Union’s (EU) Common Fisheries Policy (CFP), intended to be ready for progressive implementation from the beginning of 2013. By examining with a critical eye the current style of governance, where almost all decisions are taken at the highest political level in Brussels, the Green Paper documented significant problems facing the CFP in this regard. Although the Commission did suggest that the regional dimension of the CFP governance system could be enhanced by relying ‘wherever possible on specific regional management solutions implemented by member states’ through means of delegation that ‘would need to be organised at the level of marine regions’ (Commission 2009:10), the document remained weak in terms of giving specific directions or suggestions on how in practice regionalisation could be achieved. The present article reports on an exploratory investigation of opinions and arguments about regionalisation as a policy element in the reform of the CFP. The key informants were participants or potential participants in debates on regionalisation, representing different interests in the CFP: managers, policy-makers, fisheries sector or representatives of environmental interests, and so on. In particular we carried out a survey of individuals who due to their participation in the Regional Advisory Councils (RAC) have obtained hands-on experience of doing regional cooperation in EU fisheries management. This experience places them in a unique position in terms of proving insights on how regionalisation could most appropriately be further developed. The aim of our research has been to look for different patterns of ideas and opinions to get an impression of where they converge and diverge, and thus point in the direction of potential political agreement or conflict. As described in detail by Symes (2012) earlier in this special issue, the debate over regionalisation of the CFP is not new. Rather, the issue has been more or less on the agenda since the beginning of the 1990s. However, in terms of reorganising the governance system of the CFP towards regionalisation, interest and activity in this regard peaked in connection with the previous reform of the CFP, which was implemented from the beginning of 2003. At that time, the simultaneous concern of the CFP not being sufficiently responsive to stakeholders’ perspectives nor to regional particularities led to the setting up of a structure of regional advisory bodies; the RACs, consisting of stakeholders, predominantly from the catch industry and the wider fisheries sector but also including other interests such as recreational fishing and environmental groups, etc. While focus in the years immediately following 2003 seems to have been most on institutionalising the RAC system, which is primarily intended to provide a regional stakeholder perspective to the Commission’s deliberations rather than providing stakeholders with real decision-making authorities, interest in further regionalisation seems to be on the rise, in the most recent years with the publication of the Commission’s Green Paper as a milestone in this regard. For more information on the background of CFP regionalisation, please consult the article by Symes earlier in this issue. The current article applies an analytical framework developed and described in this issue (Hegland, Ounanian and Raakjær 2012). As we argue there, practical motivations for wanting to move towards regionalisation can basically be structured by reference to three basic objectives of CFP governance: 1) the ability of the governance system to take up and balance preferences (process legitimacy), 2) the efficient use of resources in the system, and 3) the effectiveness of policies and measures coming out of the system (content legitimacy). These objectives can then again be divided into more detailed sub-objectives that take into account the dominating cleavages in discussions on fisheries management. The second part of the framework breaks down the complex discussion of how to move forward towards regionalisation into three interrelated problem dimensions: the question of where (being the discussion of the actual politico-administrative level that regionalisation should be about), the question of who (being the discussion of roles of different public authorities and/or the involvement of private actors), and the question of what (being the discussion of various types of decisions and which of those should be considered apt for regionalisation). In the final part of our previous article, we outlined a number of so-called archetypes of regionalisation. The present article is divided in three main parts and concludes with a brief discussion of the results of our research and the way forward in relation to regionalisation in the context of the reform of the CFP. The first main section reports on the dominant perspectives on why regionalisation might be an interesting way to go within the governance system of the CFP. Then, the second part presents selected perceptions of how regionalisation could or should in general materialise in practice. Subsequently, the third part presents data on how people perceive the different archetypes of regionalisation of the CFP, when presented with those. In the last half of 2009 and first half of 2010, we employed several research techniques in order to collect and solicit opinions on regionalisation from stakeholders and others with an interest in European fisheries management. The techniques ranged from observation of meetings of RACs (four in total) and various conferences (five in total), over key informant interviews (nineteen in total) and a focus group interview (six participants from the Commission)1, to study of selected documents (predominantly some of the position documents submitted to the Commission in relation with the Green Paper consultation process) and a survey of participants in meetings of different RACs. The survey drew its participants from general assemblies and selected meetings of executive committees and working groups of the North Sea, the North Western Waters (NWW), the South Western Waters (SWW) and the Pelagic RACs in 2009. The survey employed both an online questionnaire with e-mail invitations, as well as a traditional, mailed questionnaire to those not completing the online version. The response rate for the survey was 41.9 per cent: 138 responses out of 329 invitations to participate in the survey. The breakdown of participants in the survey reflects the individuals who participate in meetings of the four RACs. Roughly half of the participants in the survey are fisheries sector representatives, a quarter are representatives of various other interest groups and constellations, and the last quarter are made up of scientists, managers and others2. Whereas the interviews and other qualitative sources of material provided us with rich, in-depth information on the various perspectives on regionalisation, our survey was designed to provide quantitative measures of perceptions of regionalisation as well as to uncover relations between preferences vis-à-vis regionalisation and particular participant attributes such as primary RAC affiliation, geographical affiliation, and stakeholder type. In particular, the survey was employed to solicit opinions about the different archetypes of regionalisation. Although this article draws on all the above sources of material, most prominently figures data obtained through interviews and the survey. In relation to all the techniques, standard scientific practice was employed. For details on the methodology of the different techniques, please consult Raakjær et al. (2010). Why should the CFP move towards regionalisation? As expected, our research presented us with a rich variety of perspectives on why regionalisation of the CFP is an option worth considering and the following sections present some of the main perceptions based upon the values or dimensions invoked in the reasoning. The first category of motivations for regionalisation that we direct our attention to is the value of a governance system that is perceived as legitimate due to its ability to take up and balance preferences of different actors in a fair and just way. Process legitimacy, as this kind of legitimacy is termed, has two sides to it: internal legitimacy, relating to the legitimacy of the process among the user groups subjected to the policy (most importantly fishers and vessel owners), and external legitimacy, related to the legitimacy of the process among other interests groups, who to some extent reflect the broader societal interest (Jentoft 2000). When investigating the empirical material, the concern for internal process legitimacy figures as a very important motivation for regionalisation. It is widely perceived that fishers themselves need to be more involved in the management process to avoid non-compliance, and that one way of accomplishing this is through regionalisation. Several of our interviewees indicate that the current system of RACs has not sufficiently solved the issue of providing a feeling of ownership over the adopted fisheries management measures. The value of regionalisation in relation to process legitimacy is also emphasised in a broader, more general sense, however. Here the focus is less on internal legitimacy and the compliance issue and more on the fact that decentralising authority to a regional level could, in general, increase the feeling of legitimacy by reducing the perceived distance between those taking decisions (at EU level) and those implementing them (at member state level) and being subjected to them—be it fishermen or other stakeholder groups who also have to live with the results of fisheries management. In relation to this, some argue that a regionalised CFP governance system would better facilitate holding those responsible for decisions accountable—which might in fact in itself also impact the nature of the decisions taken. An example of the contrary in the current system is that decisions with direct relevance for only a particular regional sea, such as the Baltic Sea or the North Sea, can be modified or blocked by EU member states without any stake in that sea area. The member states can be tempted to do so because of the perception that the decision(s) in question can in time create a precedent that might be contrary to the blocking member states’ interests in the seas where they do have a stake. A regionalised CFP governance system is perceived able to tackle this problem by reducing or altogether removing the need to take decisions pertaining only to specific regional seas at the most central level. The link between process legitimacy and regionalisation was something we briefly touched upon in our survey of RAC meeting participants, as well. In a series of questions on possible outcomes of regionalisation, survey participants were asked to indicate the importance of different outcomes by for each suggested outcome marking ‘Not important at all’ (score 1) to ‘Very important’ (score 5). In the series, one potential outcome related directly to process legitimacy, as the participants were asked to indicate the importance of the outcome of ‘Increasing compliance by giving stakeholders a larger say in fisheries management’. Notably, this measure scored second-highest mean (4.15) within the full set of six sub-questions3 indicating that this is indeed a very important concern—at least when asking a group made up of to a large extent of fisheries sector representatives. Tests for significant difference between means confirm that the importance placed on this outcome measure is greater than the four others4, but not as important as an outcome question concerned with taking into consideration local/fishers' knowledge5. The second category of motivations for regionalisation relates to the objective of efficient use of resources in the governance system. In relation to this a distinction can be made between financial concerns and concerns about limited human resources. In relation to the use of human resources and general efficiency of the system, several of our interviewees considered it inefficient that the central EU institutions engage in and spend time on discussions of miniscule issues applicable only to specific regions or fisheries, described to us by a manager as ‘such things as twine thickness and ridiculously small things like that’, instead of spending the effort on deciding and developing the overall principles and taking specific decisions that due to their nature must be taken at a central level. This way of operating is widely perceived as a misuse of resources and a distraction from what should really be in focus at the central level, namely the long-term perspective and overall strategic decisions. Several interviewees pointed to the fact that this type of inefficiency was only going to be even more prominent after the entry into force of the Lisbon Treaty (European Union, 2007) in December 2009, which requires more involvement of the European Parliament and thereby also a lengthier decision-making process at central level. The Lisbon Treaty was also raised as a turning point by a fisheries sector representative explaining why previously highly hesitant—predominantly Southern European—member states’ fishing sector interests were beginning to support regionalisation, ‘the truth is that now with the entry of the Lisbon Treaty and the […] long period of time that it supposedly will take to make decisions, the concept of regionalisation starts to soak through in the different countries’. Although the above interviewee argues that interests from Southern European member states have not been left unaffected by the discussion of decreasing efficiency following the entry into force of the Lisbon Treaty, there appears still to be a cleavage on this issue. In our survey—in the series of questions on possible outcomes of regionalisation previously introduced—we asked our participants to indicate to us the importance of ‘Relieving the EU central level of tasks (Council, Commission, Parliament)’. Upon examination, the results divided by participants from respectively Northern and Southern Europe6 indicate a significant discrepancy on the importance placed on this particular outcome. Participants from Northern Europe rank the measure as 3.53 while participants from Southern Europe score a statistically lower average at 2.617. Notably, the difference between the two groups on the outcome measure of relieving the central EU level of tasks produces the greatest difference of all six potential outcomes measured. Roughly 48 per cent from Southern Europe believe this outcome is not important (score 1 or 2), while about 18 per cent from Northern Europe feel that way. Oppositely, about half of the participants from Northern Europe feel that this is an important outcome (score 4 or 5) in comparison to only roughly a quarter of those from Southern Europe. The low emphasis by participants from Southern Europe contributes to this outcome scoring the lowest average for all participants (3.10) of all measured potential outcomes. Consequently, it seems that there is a notable geographical divide on what RAC participants are looking for in regionalisation in relation to the efficiency dimension. "The experience from my current main occupation […] is that it is very difficult and cumbersome and takes very long time to try to unite the frameworks of Natura 2000 and the CFP. I use this metaphor that I want to put up this poster on the wall. I know what I need. I need a drill and I need a screwdriver. So I go to the toolbox of the CFP to take a drill and a screwdriver. But then the CFP says: no no no, not that easy. You can open my toolbox, but I want you to put in order everything in my toolbox, from big to small, including a hammer and all sorts of instruments that I know I will not use. You have to somehow structure them in line, from big to small, colour by colour, and have everybody who also wants to maybe use that toolbox to have a look at it. […] And then, after a process of a couple of years, I can finally take my screwdriver and my drill." Another distinct perspective associates regionalisation closely to a shift towards a management approach where the fisheries sector itself carries a larger share of the costs of management by introducing ‘results-based management’ and ‘reversal of the burden of proof’. In general this approach entails that the fisheries sector, rather than being managed in detail, would be subjected to certain targets or limits to comply with, and—as long as respecting those limits, something which the sector itself would cover the costs of documenting—it may decide for itself on how to stay within the limits. This way of perceiving regionalisation links it closely to the issue of financial efficiency but it is likewise closely linked to the general issue of legitimacy by suggesting that both the system and its outputs will be perceived as more legitimate, at least among fisheries sector interests, if they have themselves been involved in developing the measures. The importance of this variation of a financial efficiency outcome of regionalisation was to some extent also measured in the series of questions on possible outcomes. In this case the survey gauged the importance of ‘Making fisheries management less costly by giving the industry more responsibility’. Although the question related to relieving the EU of tasks (see above) scored the lowest average for all participants (3.10), as explained before this is due to the low importance from Southern Europe pulling down the overall average; by contrast, for the financial efficiency measure, the overall average is universally low. The overall importance placed on reducing costs is significantly lower than the other regionalisation outcomes sub-questions.10 Apart from the measure regarding the importance of relieving the central EU level of tasks, averages of other measures dwarf this measure’s 3.34 overall mean. Currently, EU fisheries stakeholders are not accountable for the costs of oversight, scientific assessments, and other operational expenses, which may explain the relatively lower priority ascribed on reducing costs by the survey participants. The third category of motivations is those related to the objective of effectiveness (and subsequently directly associated content legitimacy) of measures and policies. This category of motivations centres on the extent to which a regionalised CFP governance system would better enable the delivery of policies and management measures that realise the policy goals, which are perceived as important—be it conservation, rationalisation, or social/community benefits (Charles 1992). On a very general level, the main issue in relation to this objective is the perception that the centralised nature of the current system makes the CFP incapable of responding sufficiently to the diversity of needs in different regions—be it the needs of the regional fishing sectors or the regional ecosystems. Responding in the most suitable way to the needs and interests of, in particular, different segments of the European fishing fleet would, the perception is, be more possible in a system where detailed knowledge of the specifics of the local or regional setting could be put more directly to use in decisions on management. Notably it is not only fisheries sector representatives arguing this, as evidenced by this quote from a representative from a conservationist organisation, who suggest experimenting with taking decisions at ‘a more regional or local level where fishermen basically can be more involved in coming up with the solutions that would result in the objectives that have been agreed—because most often you have a number of different choices, different ways to do things’. The need to make better use of local knowledge was another of the possible regionalisation outcomes that we measured the importance of in the survey. The participants were asked to indicate the importance of ‘Providing better management by taking into consideration local/fishermen’s knowledge of the system’ on the earlier described five-point scale and the mean of this proposed outcome proves to be the highest of all outcome means, namely 4.33; indicating the perceived high importance of this outcome11. A slightly different aspect of the quality of fisheries legislation and management relates to the increased time it will take to reach decisions in the area of fisheries at the EU level after the entry into force of the Lisbon Treaty. Several interviewees argued that this in itself requires regionalisation to make sure that the decision-making framework can still respond to emerging needs in a timely manner. This value is strongly associated with the point made during the previous discussion of the efficiency of the system; however, in the present context the concern is about the actual ability to apply timely—and thereby effective—management measures rather than the efficient use of resources but arguably the two are intimately linked. Another perspective, which is also closely linked to the discussion of efficiency, is the challenge of integrating policies, the perception being that regionalisation can facilitate not only efficient but also better and more correct integration of policies because both environmental policy (represented by the MSFD) and fisheries policy (represented by the CFP) would then have regional set-ups. This perspective was also something we investigated in our survey question on potential outcomes of regionalisation. We measured the importance of ‘Integrating fisheries into general maritime policy’ and the importance of ‘Paving the way for ecosystem-based fisheries management’. Both relate to the priority of well-functioning policy integration. Overall, these two measures of integration average close to one another in terms of importance with the maritime question averaging slightly lower than the ecosystem-based management question, 3.74 versus 3.89 respectively. Stakeholder type reveals the most interesting comparisons on these measures. Comparing the overall group of fisheries sector representatives to other stakeholder interests reveals a marked difference in the level of importance placed on these potential outcomes. In the case of representatives of environmental interests, they exclusively selected somewhat (score 4) to ‘very important’ (score 5) for the ecosystem-based management measure, whereas fisheries sector responses distributed more evenly throughout the answer options with 31 per cent choosing below neutral, 24 per cent selecting neutral, and 45 per cent choosing above neutral. The difference in importance on this outcome represents one of the major cleavages between the EU fisheries stakeholder groups. Perhaps it is not surprising that those working for organisations promoting the environment value ecosystem-based management highly as an outcome; nevertheless, the neutrality of the fishing sector uncovers a discrepancy in the motivations for regionalisation as it does not equate to ecosystem-oriented planning to the same extent for all stakeholder groups. The following sections contain perspectives on selected issues, which seem to be among the most important in the discussion when trying to settle on how to put regionalisation into practice. These perspectives are organised under three headings, each referring to a particular problem dimension; the dimensions of ‘where’, ‘who’, and ‘what’ (Hegland, Ounanian and Raakjær, 2012). Clearly, to some extent the question of how to regionalise is linked to the perceptions of what regionalisation is intended to deliver, which we discussed in the previous section. Likewise, in practice perceptions related to one problem dimension was often closely attached to particular perceptions of the appropriate ‘solutions’ in relation to the other problem dimensions. The CFP governance system stretches over three, core politico-administrative levels: the central EU level, the intermediary level of regional EU seas (where the embryonic institutional structure is basically represented by the RACs), and the member state level. These politico-administrative levels poorly match the biogeophysical scale levels of the marine ecosystem or the way that the fisheries fleets of the member states operates—often across the waters of several member states and fishing on stocks shared by multiple member states. Consequently, a problem dimension to address when trying to carve out how regionalisation could be put into practice is the ‘where’ dimension, in the sense of addressing what scale level(s) that regionalisation should be concerned with and how to organise the politico-administrative level(s), for instance in terms of dividing it up in regional units. Although we found diverging perceptions on these questions, this proved to be the problem dimension where there was most agreement on what regionalisation ought to entail. Most of our interviewees were of the perception that regionalisation should be about strengthening the intermediary regional seas level; the same was reflected as a general tendency in our other empirical material. Nevertheless, several of our interviewees also pointed to the need for getting management even closer to those affected, meaning regionalisation as a subnational process or by collaboration of fewer member states than those associated with a regional sea area, which would be relevant in cases where only a few member states have interests in a certain sea area. However, it does not seem that there is any great tension between these perceptions; rather, those arguing for a more ‘local’ regionalisation also generally saw the need for strengthening the intermediary regional seas level and even to some extent were of the opinion that this in itself could facilitate the move towards more ‘local’ regionalisation by fostering a transition from a centralised management system to a management system built more solidly on the principle of subsidiarity. The most significant cleavage, within the general agreement that the intermediary regional seas level is what regionalisation should be about, is found between those basically favouring regionalisation as something related to the current RAC regions (determined by fisheries policy) and those of the opinion that the geographical units of regionalisation should basically come out of other policy areas (generally environmental policy and the MSFD). From a narrow fisheries perspective building as much as possible on the current system appears preferable and the RACs have been set up to best reflect functional regions within fisheries management. At the same time, others argue that the integration of policies requires that an effort is made to reconcile varying spatial divisions of different policy areas and that the RAC regions are not necessarily the most appropriate for this. The second problem dimension highlights the question of whom to regionalise to. In other words—based on the perception that regionalisation must involve at least some reshuffling of/or generation of new authorities (broadly conceived) among the actors operating in the governance system—an important discussion relates to who should ‘benefit’ from this and in what way. Based on our research two main issues are associated to this problem dimension: 1) authority of stakeholders compared to public authorities/governments; 2) role of fisheries sector interests compared to wider societal interests, as well as compared to other economic sectors with a stake in the regional seas. In relation to the first, the point-of-departure of the CFP is a situation where the stakeholders’ role at least at the central EU level12 is restricted to that of providing advice through the RACs and the Advisory Committee on Fisheries and Aquaculture (ACFA), which following an understanding of different levels of stakeholder involvement, see beneath, represents a low level of stakeholder influence—only being a single notch above ‘top-down hierarchical management by the state’. As documented in the previous section, there is widespread agreement that getting the decision-making process closer to the stakeholders is a necessary precondition to deliver on the legitimacy-dimension. To many, moving the decision-making process closer to stakeholders equates to moving from a system where stakeholders are exclusively giving advice and thereby being at arm’s length from actual decision-making to a system where stakeholders are involved in taking decisions in one way or the other, either as partners in the process or through self-management. However, although a popular perspective, there are also many concerns voiced in this regard, including the capacity of various stakeholders, democratic accountability, as well as legal problems. For more on the legal constraints that regionalisation might be facing, please refer to Symes (2012) in this issue. In addition, an important issue remains the role of fisheries sector stakeholders compared to other stakeholders. Here some perceive that industry stakeholders should be at the centre while others perceive that regionalisation should constitute a break with the current practice of giving industry stakeholders a preferential position in the advisory bodies. From the industry perspective, one of our interviewees emphasised that the industry (as opposed to other interest groups) should remain the key player by suggesting to ‘bring closer the debates, the consultations, even the decision process, to those who would be affected, and the main affected are us as fishing organisations, as ship owners’. Probably the most contentious problem dimension in the debate over regionalisation proved to be the question of what to regionalise. This includes perspectives on whether regionalisation should merely involve strengthening the advisory role of the intermediary regional level or if decision-making capabilities should be moved to the regional level. And obviously, in case of the latter, the question remains as to determine what decisions should be placed at regional level. It seems clear that under the CFP a hierarchy of decisions exists, and some decisions are more suited to keep at central level and others are better suited for regionalising; however, how people perceive that hierarchy varies is in many cases unclear or unarticulated13. In relation to the question of authorities to be given to the regional level, the first issue concerns the magnitude of authority to be vested with the regional level. Here perspectives spread over a scale ranging from the regional level being purely advisory vis-à-vis the EU central level (generally taking policy-decisions) and/or the member states (generally taking implementation decisions), over variations of ‘binding advice’, to the regional level being awarded specific, limited decision-making powers on regional matters, which are then expanded as we get further towards the end of the scale. In the most pronounced visions of regionalisation only authority over the most essential decisions are to be maintained at the central EU level. A purely advisory version of regionalisation without any decision-making competence being delegated is by many considered a weak instance of regionalisation; however, this is a relatively uncomplicated type of regionalisation to put into practice, as it does not pose legal problems—as one manager put it in an interview, ‘it is just a policy recommendation, even as an representative from a non-governmental organisation you can recommend something, that is easy, and that has not serious requirements on structure, mandate, legal status, and things like that.’ This is a pragmatic argument but is does carry weight in the context of policy-reform—not least in circles of managers and policy-makers. On the other hand, others perceive that there is a great risk that this does not create significantly more feeling of regional ownership over management among stakeholders than the current RAC system has done, which is exactly a system where the regional level provides advice to the central level. Consequently, where this approach may provide for regionally more tailor-made management, which will enjoy content legitimacy, the benefits in terms of process legitimacy might be limited. When considering regionalising some degree of real decision-making authority, which is by many perceived as preferable as it would potentially provide for both legitimacy and efficiency benefits, one cited concern relates to the potential risk of regionalising too much—in the sense of regionalising authority that rightfully should be kept at the central level; e.g. in order to ensure that the industry, which is part of a common market, operates on a level playing field. Although room for competition between regions should be allowed so that best practice can be developed, it is perceived as important that regionalisation does not lead to varying degree of fulfillment of the overall objectives and principles across regions. Other concerns relate to the legal problems involved in delegating decision-making authority as well as the lack of democratic oversight at regional level, where no traditional, democratic representative structures exist. As some of the final questions in our survey we asked our population of RAC meeting participants to score their level of approval or disapproval for five possible models of regionalisation, ‘archetypes’, plus the option of retaining the present system (referred to as ‘Present Structure’), as well as pick their top choice and least desirable model. The five regionalisation models, which were intended to help us explore aspects of the preferences in relation to the different underlying problem dimensions in designing regionalisation, included 1) a ‘Nationalisation model’, a model of decentralisation rather than regionalisation, under which the member state level would be the new centre for fisheries management decisions; 2) a ‘Cooperative Member State Council’ (CMSC) model, under which member states’ authorities would work increasingly together at regional level but without formally changing the present structures or allocation of authorities; 3) a ‘Regional Fisheries Management Organisation’ (RFMO) model, under which member states’ authorities working jointly in a regional organisation would be awarded wide-ranging decision-making powers in relation to regional fisheries management but where stakeholders would be kept at arm’s length as advisors to the process only, 4) a ‘Regional Fisheries Co-management Organisation’ (RFCOMO) model, that resembles the RFMO but instead of keeping stakeholders as advisors they are invited into the decision-making process as partners; and, finally, 5) a ‘Regional Marine Management Organisation’ (RMMO) model, under which fisheries management would be taken care of as one of more issues by a regional organisation awarded wide authorities for regional marine management at large. The three last models can be viewed as variations of a theme, namely regional management organisations. The full descriptions of the models, as they appeared in the survey, can be found beneath and a more thorough discussion of the models and their selection can be found earlier in this issue (Hegland, Ounanian and Raakjær 2012). The member states are awarded the responsibility for the conservation of resources in their own Exclusive Economic Zones. Issues relating to shared stocks would be sorted out through a system of bilateral agreements between member states or any other arrangements that the member states themselves deem necessary. The level of involvement of stakeholders would be an issue for the individual member state to decide. Under this model the member states would be given wide authority for fisheries conservation on the condition that the member states with fishing interests in a regional sea area establish a regional fisheries management organisation (RFMO) to deal with fisheries management issues specific to that area. A general framework for regional approaches will be provided by the central EU institutions. The stakeholders’ input will continue to be channelled through the RAC. However, the RAC would in most cases advice the RFMO rather than the central EU institutions. The exact extent to which stakeholders’ input is given weight in the decision-making process of the RFMO is up to that organisation on a case-by-case basis. Under this model the member states would be given wide authority for fisheries conservation on the condition that the member states with fishing interests in a regional sea area establish a regional fisheries co-management organisation (RFCOMO) to deal with fisheries management issues specific for that area. A general framework for regional approaches will be provided by the central EU institutions. The RACs would cease to exist; instead stakeholders, scientists, and member states’ administrators would work together within the RFCOMO to determine the best strategies for their regional area. Under this model the member states would set up regional marine management organisations (RMMO) with responsibility for coordinating all matters relating to the regional sea areas. Stakeholders from all sectors would be involved in some form—either as advisors or in a more co-management-like structure. The RACs could continue to operate, but would only be providing advice as one of the affected sectors of the RMMO. Alternatively, the current RACs could be opened for a wider group of stakeholders. A general framework for regional approaches will be provided by the central EU institutions. The institutional structure and formal distribution of powers remains largely unchanged. However, the member states with fishing interests in a regional sea area establish mini-councils to deal with fisheries management issues specific to that area. These mini-councils forward their recommendations for formal approval to the overall EU Fisheries Council. The RAC would in most cases advice the mini-council rather than the central EU institutions. The exact extent to which stakeholders’ input is given weight in the recommendations of the mini-council is up to that mini-council on a case-by-case basis. It should be noted that the models remain rough outlines of the intended institutional structures, closer to fisheries institutional archetypes than fully developed governance models. Moreover, the survey participants were specifically asked to disregard legal problems of implementing a model so what we gauge is in principle their preference rather than what they believe most likely to materialise. In the first question relating to the archetypes, we asked the survey participants to score their level of approval for each of the variations. The participants could choose between answers ranging from ‘I would approve’ (score 1) to ‘I would disapprove’ (score 5) with a neutral midpoint and statements of moderated approval or disapproval. Figure 1 summarises the four RACs’ and the total population’s aggregate approval of all six options (five plus ‘Present structure’). 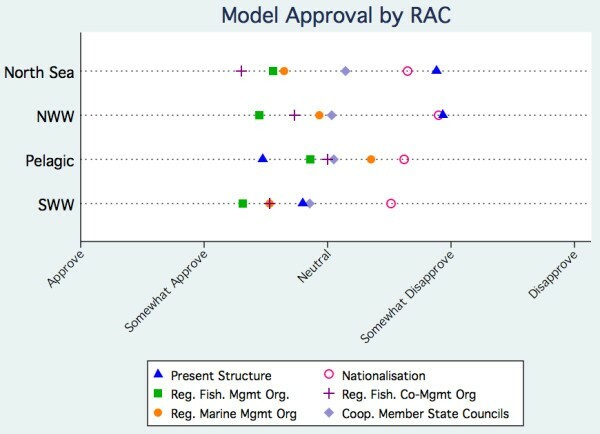 Averages of approval ratings for each model of regionalisation by rac. (N = 34 (North Sea), 30 (nww), 21 (Pelagic), 34 (sww). The calculated averages derive from the numerically coded values of the answer choices. A mean of 1.0 represents unanimous approval whereas 5.0 indicate unanimous disapproval with 3.0 representing the neutral midpoint). After scoring the degree of approval for each of the six models, participants were asked to select their top choice and least desirable model with the option to select ‘None of the above’ included. Table 1 summarises the frequencies and relative percentages delineated by RAC as well as the total for our population for the selection of top choice. (N = 117. The row percentage indicates the percentage within the RAC with the column percentage listed below represents the amount from the RAC making up the model preference). Our data shows that there is a statistical association14 between the RAC that the survey respondent is most active in and top choice model. This means that a person’s primary RAC is somewhat predictive of the model he or she picks as the top choice. However, the association between RAC and least desirable model, for which we have not provided a table, is not significant due to high disapproval of the Nationalisation model dispersed over the four RACs; in total 41.38 per cent picked the Nationalisation model as least desirable. Nonetheless, we did notice a stronger tendency for the SWW RAC participants to find the Nationalisation model to be least desirable leading us to test if there was a geographical divide on the issue and indeed that turned out to be the case15. Approximately half of those from Southern Europe selected the Nationalisation model as the least desirable model whereas this was only the case for roughly a quarter of those from Northern Europe. This pattern may stem from a combination of Northern Europeans being generally more dissatisfied with the current centralised system and Southern Europeans putting more emphasis on access to waters and funding opportunities. The finding is supported by the fact that a related pattern can be found in connection with the Present Structure, which is selected as least desirable by more Northern European than Southern Europeans. Returning to Figure 1 above, some findings emerge when examining the plot of approval means. First, there is a significant16 split along the four RACs on the Present Structure. The North Sea and NWW RACs both disapprove of the Present Structure, whereas participants from the Pelagic and SWW RACs fall between neutrality and approval of the current system. Consequently, the drive for reform seems considerably stronger in the North Sea and NWW RACs. Likewise, the results for the CMSC model draw an interesting picture. The approval-disapproval rating (Figure 1) for all participants for this model averages to 3.00, an indication of exact neutrality or an average of two extremes. Moreover, the mean plots reveal that this model sits closest to neutral for all four RACs under observation (North Sea, 3.14; NWW, 3.03; Pelagic, 3.05; SWW, 2.86). Looking at Table 1 and the frequencies for selection as least desirable model, for which we have not provided a table, reveals a sort of ‘love it, or hate it’ dichotomy. The North Sea RAC displays this phenomenon most clearly as eight (23.5 per cent) North Sea participants selected the model as the top choice and seven (20 per cent) chose it as the least desirable model. A possible explanation to this might be that among our models this one is likely associated with the largest number of actual practical variations, which differ significantly in terms of ‘how far’ they will take regionalisation (Hegland, Ounanian and Raakjær 2012). Moreover, this particular model is not as strongly institutionalised and might lack the regional identity that many seem to look for in regionalisation but to others may be viewed as attraction. The RFCOMO model ranked highest in terms of top choice (Table 1), exceeding the next top rated model, RFMO by 10 per cent. In terms of approval means (Figure 1), the RFMO model averages to a level associated with the greatest degree of overall approval (2.50) and the co-management version is associated with slightly lower levels of approval (2.64). Notably, as well, in relation to least desirable model, these two variations of regional management organisation models receive the lowest share of selections, both drawing only 3.51 per cent, indicating that these are generally favourably perceived and appear as the worst options to very few. The approval mean of the RMMO is 2.81, which places it close to the two other regional management organisation models. However, the RMMO attracts slightly less top choices than the RFMO and considerably less than the RFCOMO. In general the three regional management organisation models score relatively high without exhibiting the love-hate dichotomy of the CMSC model. The preference for the RFCOMO reflects well that many are, as discussed earlier in this article, looking towards regionalisation as an opportunity to bring stakeholders closer to the decision-making process. In general, in terms of model preferences, it should be noted that the Pelagic RAC remains an outlier. The survey participants from the Pelagic RAC are less enthused by the models outlined and are less hostile to the current system. Likely, for the Pelagic RAC a special solution will have to be made, like it has in the current framework, where the Pelagic RAC and the Long Distance RAC exist as the only two structured along certain types of fishing rather than along a geographical region. Table 2 aims to illustrate the diversity of preferences, as well as the general convergence of preference for regional management organisation models. Nonetheless, readers should recall that the number of participants in each stakeholder category is not uniform nor does the type of stakeholder dictate preference for particular models when interpreting the table. (N = 107. Percentage and frequency both presented). As evidenced by Table 2, the three models in the theme of regional management organisations gather significant support among all types of survey participants. Noteworthy, however, is the limited support for the RMMO among industry survey participants compared to other groups. This supports the finding reported earlier that industry puts less value on the issue of integrated management in the context of regionalisation than other groups included in the survey. Although not statistically significant due to the few conservation representatives, it can be noted that eight of the 13 conservationists support the RFCOMO model, which suggests that stakeholders—and thereby not necessarily only the industry—should have more say in management. It might be in this light that the less enthusiastic view of the industry upon this model compared to that of the conservationist should be seen; parts of the industry may well view this as a model where they compared to the current RACs potentially risk losing a privileged role, since the industry presently occupies two-thirds of the seats on the RACs. So where does this leave us in terms of mapping a way forward for the CFP? Or in other words: what are the implications for policy? As described, regionalisation is widely perceived as a compelling way to approach a range of problems that the governance system of the CFP is suffering under. In particular two perceived values of regionalisation seem worth highlighting in this context; namely, on one hand, the general issue of increased legitimacy deriving from getting the decision-making process closer to those subjected to decisions and, on the other hand, the specific issue of increased ability to respond appropriately to regional fisheries management challenges with tailor-made solutions—preferably building on detailed local or regional knowledge. In combination with the results from our survey (see Table 1), which shows that almost 80 per cent of the participants prefer one of the ‘true’ models of regionalisation (RFMO, RFCOMO, RMMO, or CMSC) over an alternative approach (‘None of the above’, ‘Present structure’, or ‘Nationalisation’), there seems to be a strong case for a reform of the CFP that moves it towards regionalisation along the lines of one or a combination of the models. Despite widespread agreement on the positive potential of regionalisation, there is less agreement on how a regionalised CFP governance system might look like. Opinions diverge in particular on the question of advisory versus decision-making powers, and the role to be played by various regional actors, particularly the balance between (fisheries sector) stakeholders on one side and governmental authorities on the other. A defining cleavage in the regionalisation debate is the question of the level of de facto authority to be placed at the regional level. Here opinions are articulated along a scale ranging from advisory powers only, over decision-making powers on specific issues, to decision-making powers on a wide range of issues. Keys to understanding the difference in perceptions on this issue include diverging perceptions of what is legally possible, what is reasonable from a democratic point-of-view, as well as the importance placed on maintaining a ‘level playing-field’ across the EU. The issue of the level of involvement of stakeholders at the regional level constitutes another contentious issue in the debate. Here the division arises between those emphasising that regionalisation should result in more genuine co-management, and those who for various reasons prefer keeping stakeholders at arms’ length from the decision-making process by continuing the current modest involvement of stakeholders. From various sides, including fisheries sector stakeholders themselves, concerns as to the readiness of the sector to take on co-management responsibility have been raised. In addition, the more ambitious co-management solutions might be legally more complex and democratically more questionable to put into practice than solutions where the decision-making authorities are kept clearly within the realm of accountable, public authorities. The firm dismissal of the nationalisation option, the mixed to negative feelings towards the present structure and the low number of people indicating a preference for another model than those outlined, leaves us with a situation where, although there are frustrations with the EU bureaucracy, fisheries stakeholders do generally coalesce on the idea of unified management strategies for shared resources. However, they look towards more of these unified management strategies being developed for and exercised at a regional level; though there are indications that this wish is stronger in the North Sea and NWW RACs than in the Pelagic and SWW RACs. Of our four ‘true’ regionalisation models—RFMO, RFCOMO, RMMO, and CMSC—it is notable that the RMMO, which presupposes integrated management of the various maritime sectors, received relatively few ‘Top choice’ nominations from industry stakeholders. The same lukewarm feelings towards maritime integration and ecosystem-based approaches among industry stakeholders were also reflected by the fisheries sector stakeholders’ general hesitance to pick ecosystem-based management as one of the primary outcomes of regionalisation. This indicates that building institutional structures specifically intended to integrate fisheries with broader maritime management will require the fostering of buy-in from this key stakeholder segment. Oppositely, the perspective of ecosystem-based management in a regionalised CFP is the overall top choice among scientists. In contrast, it is not a lukewarm reception by the stakeholder community that leads us to suggest that the RFCOMO may also not be the most appropriate choice as a general model for regionalisation. Rather, this model was well received among industry stakeholders and conservationists alike. Nevertheless, the concern for stakeholder preparedness voiced by several of our interviewees seems a valid intervention. In fact, to some extent the RFCOMO reflects a one-size-fits-all fix that potentially fails to acknowledge regional differences. In contrast the RFMO, as we have outlined it, remains open to varying degrees of stakeholder involvement at regional level being developed over time. In this sense, the RFMO remains more true to the philosophy behind regionalisation than the RFCOMO—at least as a standardised solution to roll out over the entire EU maritime space. Effectively, with the above in mind, we are left two feasible ways forward towards regionalisation of the CFP: a minimalist Cooperative Member State Council model and a more ambitious Regional Fisheries Management Organisation model. The preference among stakeholders for the RFMO compared to the CMSC echoes the calls for a true commitment to integration of local knowledge, increased stakeholder engagement, and the need for more tailor-made management. To many, the mandate of RACs has not secured true stakeholder engagement in the decisions, which impact EU fisheries management. The CMSC, which also attracts a number of top choice selections, is the model that most clearly divides opinions. Although this model may not deliver the level of commitment or increase in stakeholder influence desired by many stakeholders, it may nevertheless stand as an attractive pragmatic next step towards more developed regionalisation. Nevertheless, based on our analysis, we are of the opinion that the most appropriate and forward-looking move in the coming reform would be towards a solution building on the principles of the RFMO model, thereby signalling commitment to regional solutions and expertise, as well as pointing towards further development of the ecosystem approach to management. We acknowledge of course that deciding on the RFMO approach as the appropriate end goal does not mean ‘end of the story’. A range of challenges remain and there are multiple issues to sort out, but making a commitment to this approach would give guidance in the search for solutions. For further discussion of the way forward, please refer to the concluding article of this special issue (Raakjær et al., 2012). 1 The interviews (incl. the focus group interview) involved two researchers, ten managers, three policy-makers, eight fisheries sector representatives and two representatives from non-governmental organisations. 2 In terms of geographical affiliation, the participants come from ten EU member states; in addition a few comes from states outside the EU or categorise themselves as ‘European’ or ‘International’. Not surprisingly, in terms of numbers, the four largest fishing nations of the EU, namely Denmark, United Kingdom, France, and Spain, dominate the group of participants with 84 responses in total. 3 For the series of six outcome questions the total number of responses ranged from 125 to 126. 4 There is a significant difference between means of ‘Increasing compliance by giving stakeholders a larger say in fisheries management’ and ‘Paving the way for ecosystem-based fisheries management,’ t(125) = 2.48, p = 0.015, differentiating the mean of second highest measure from the four descending means. 5 The option, ‘Providing better management by taking into consideration local/fishermen's knowledge of the system,’ has a statistically higher mean, indicating more importance placed on the measure than ‘Increasing compliance by giving stakeholders a larger say in fisheries management,’ t(125) = 2.30, p = 0.023. 6 Southern Europe comprises in this context France, Portugal, and Spain. Northern Europe comprises Belgium, Denmark, Germany, Ireland, the Netherlands, and the United Kingdom. 7 T-test reveals statistical difference between means of 3.53 and 2.61 t(103) = 29.96, p < 0.001. 8 The MSFD requires the member states to achieve ‘good environmental status’ (GES) of their seas by 2020. 9 Natura 2000 is a network of protected areas designated as a requirement of the Habitats Directive (Council, 1992), ‘special areas of conservation’, and the Birds Directive (European Parliament and Council, 2009), ‘special protection areas’. 10 Paired t-tests reveal that ‘Making fisheries management less costly by giving the industry more responsibility’ is statistically higher than ‘Relieving the EU central level of tasks (Council, Commission, Parliament)’ with t(124) = 1.69, p = 0.09 and statistically lower than ‘Integrating fisheries into general maritime policy’ with t(124) = -3.20, p = 0.002. 11 Paired t-test confirms that ‘Providing better management by taking into consideration local/fishermen’s knowledge of the system’ is statistically different than the question with the second highest mean for the outcome series, ‘Increasing compliance by giving stakeholders a larger say in fisheries management’ with t(125) = 2.30, p = 0.02. 12 Generally mechanisms for involving stakeholders do exist at member state level. 13 We will not go into the discussion of whether regionalisation should be about fisheries or marine management at large, although this discussion is clearly also related to the question of what to regionalise. Although important, this debate did not come out as strongly in our interviews or the position documents, as the discussion over the level of authority to be vested with the regional level. Granted, a few of our interviewees argued that regionalisation should really also be about integrating fisheries in more general maritime management; however, the predominant perspective seems to be that at this point concentration should be on reforming the CFP and insofar that the reform could facilitate integrated management then that may be alright but it should not be at the foreground of the discussion. In particular, this seems to be the perspective of industry stakeholders. 14 The Fisher’s exact produced a value of 0.06, which confirmed significant association between primary RAC and top choice of model. 15 The Fisher’s exact value of 0.01 confirmed significant association between geographic affiliation and least desirable model. 16 The analysis of variance (ANOVA) confirms the statistical significance in the difference in approval means by RAC with F(3, 116) = 10.07, p-value < 0.001). Furthermore, RAC membership contributes a medium-large effect size with R2 = 0.21. This article has been written in connection with the Making the European Fisheries Ecosystem Plan Operational project (MEFEPO, project website: http://www.liv.ac.uk/mefepo), which have received financial support from the Commission through the Seventh Framework Programme. The present article does not necessarily reflect the Commission’s views and in no way anticipates its future policy. We remain grateful to David Symes (University of Hull) for his insightful comments on an earlier draft of this paper. We are likewise thankful for the comments provided by other co-authors of this special issue and project partners. The article is based on joint work of the authors; authors are listed alphabetically. TJH drafted the manuscript. All authors read and approved the final manuscript.